The white birds were constant. Whether Mhumhi chased them over the ridges of garbage or watched them wobble and wheel above on the breeze, they were always there. When some flew away, there were more to replace them, coming across the vast sea of water. The water itself was bad to drink- they had not needed to taste it; it was obvious from the smell- and clotted with trash, so that it actually extended a few meters closer to the shore than Mhumhi had initially realized. There was a floating layer of plastic that rolled and heaved like a living thing over the waves. The birds sometimes flew down and floated on the waves, too, tucking their wings in, bobbing with the trash. Mhumhi found it hard not to watch them. It was not just that their alien movements were fascinating; it was that the strange predatory hunger returned to him when he did. If he did not catch himself, he would quickly become fixated, staring in a manner that made the birds start moving away from him, waddling nervously over the trash. The birds lit up, calling, because Kutta had come splashing out of the water, wading though the floating trash. She stopped and shook herself, sending water flying in an arc. Behind her the water was blushing from the reflection of the sunset. Mhumhi sat up, and she wagged her dragged rat-tail at the sight of him. “It’s nice for a swim,” she said, loping up to join him, slipping a little as her feet disturbed trash. “That’s why I got out now,” said Kutta, and shook herself again. Mhumhi, now resigned and dripping, sighed. Mhumhi had nothing to argue with that. He followed his sister back away from the water, walking slowly over the hills of trash. There were still many screamers out, picking away in the last light. As Mhumhi passed them they became dark, hunched silhouettes against the sunset. They heard something then- a hyena giggle. At once Kutta quickened her pace, Mhumhi loping to catch up. They came over a hill and found Vimbo facing off with a screamer in a dirty little valley. Vimbo’s short tail was curled up, his jaws open. The screamer was cringing next to a large tire, holding Mini tucked under one arm. “Mini!” called Kutta, and Vimbo turned back to look at her. The screamer scrambled up against the slope of the trash-laden hill. Vimbo swung back around and jumped onto a tire with a moaning whoop. Mhumhi darted around the other side of the depression and got in front of the screamer, making it cringe and howl, sliding backwards on the trash. Kutta was racing around the other way, whistling. The screamer made a shrill sound, clutching Mini against itself with both arms. Vimbo gave a squeal and jumped from the tire, landing heavily against its back. The screamer fell forward with a cry, on top of Mini. Mhumhi ran down the hill, to where the screamer lay prone, Vimbo circling around it. He could see Mini’s head poking out from underneath it, her eyes squeezed shut. “Are you all right?” he asked, his heart beating rapidly. Above him, Kutta was whining on the ridge. Vimbo gave another sound and took the screamer by the elbow, tugging at him. This seemed to wake it all at once, for it shrieked and thrashed, breaking free of his grip, and darted away past Kutta. She let it go. Mini was still lying there on the trash. “Mini, say something, please,” Mhumhi urged, almost afraid to even sniff her. “Of course she’s fine,” said Kutta, who was coming down to join them. “I’m fairly sure that’s not why he hangs around with us,” said Mhumhi. He stepped towards Mini, leaning down to pick her up by the scruff, but Vimbo gave a strange arrested jerk, swinging his head to stare at him. Mhumhi held still for a moment. “Alright, you take her,” he said, stepping back. Vimbo did, as if he had understood, pulling her by her rear again. As he did, Mini gave a soft snort. “Let’s get back to Tareq,” said Kutta, nudging him. Mhumhi caught her concern. But Tareq was just where they had left him, near the entrance to the underground tunnel, happily involved with his own affairs. He had amassed a collection of the small plastic things Mini had called phones- all different colors and sizes, but always square- piles and piles of them. Every now and then he would pick one up and press it to his ear, his lips moving soundlessly. “Have you gotten in touch with anyone yet, Tareq?” Mini called out, swinging from Vimbo’s jaws as they approached. Tareq shook his head from side to side, and put the phone he was holding down into one of the piles. Kutta ran over to him, her tail wagging. Tareq pushed his lips out, glancing at his piles. Mhumhi went over and pushed his head against his side. “Get your food,” he said, nudging his way underneath Tareq’s arm. Tareq giggled, because Mhumhi’s head was very big underneath his skinny elbow. “Meat?” he asked, stroking Mhumhi’s chin with his other hand. 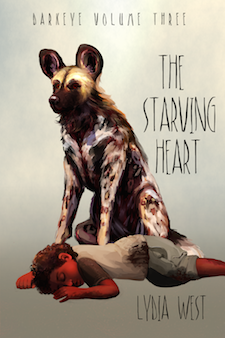 “Some meat,” said Mhumhi, his stomach roiling a bit, and then hacked up a meager pile. It was not all reddened. Kutta came up to them, and Mhumhi turned his head to poke her in the corner of the mouth, so that she offered the contents of her stomach as well. They had eaten a varied diet that day. After they had discovered the rest of the carcass of the animal that the screamer had been eating, they had also discovered a nest of mealy grubs in its rotting chest. There were birds eating them. Kutta reasoned that if the birds could eat them, so could they. Mhumhi had not been enthused about the idea. It reminded him of Bii. Aside from the grubs, they had picked up a few scraps here and there- old boxes and cans that still smelled like food were buried in some of the piles, and they had dug them up and eaten their salty contents. It all seemed to be salty, really, in this place, with no fresh water. Mhumhi had been feeling parched for half the day. Tareq was picking out the bits of meat from the glop they had given him, grimacing. “Mini can have some, too,” Mhumhi added. “He didn’t happen to bring you any water, did he?” asked Kutta, smacking her lips. “I wonder why so many stay in the tunnel and not out here?” said Mhumhi. The statement hung over the group for a moment. Mhumhi scuffed a bottle cap along the ground with his paw. “What animal?” asked Mini, turning her head. “A little cow?” said Mini, turning her head the other way. Vimbo gave a little grunt and deposited her on the ground, working his jaws. “It must live around here, same as the birds do,” said Mhumhi. Mhumhi trailed off, and looked around. There were only the endless waves of garbage, as far as he could see. Mini stopped squirming and panted, her tongue falling downwards out of her muzzle. “Maybe,” countered Kutta. Mini gave a little wheeze and tried to turn her head. Kutta stepped forward, bumping Vimbo so that he stepped back with a soft giggle. She took Mini’s hind legs in her mouth and raised them so that they flopped down the other way. Mini gave a little gasp of relief as she untwisted. “Sorry,” said Mhumhi, putting his ears back. “I wasn’t in trouble,” said Mini, who was panting again with the side of her head pressed to the ground. “That was just a guess,” Mini put in. “Why?” said Kutta, a sharp edge coming to her voice. “How could they have looked everywhere?” Kutta countered, but Mhumhi’s tail had lowered again. Kutta looked like she was biting back another retort, her brow wrinkling. Mhumhi nudged her. “Then what tomorrow?” said Kutta. Her shoulders were hunched, her voice dispirited. Mhumhi licked her ears. They found some scraps of cloth and one old, lumpy pillow that smelled deeply of mold, and dragged them together. Vimbo put Mini on the pillow and curled up beside her, and Mhumhi and Kutta squeezed Tareq in between them on the other side. As the sun went down, the breeze grew chillier. Mhumhi was glad for Tareq’s warm hulker skin. They woke early the next morning after a fitful night of slumber. Mhumhi’s stomach had been churning from his unpleasant meal, and he suspected Kutta had fared little better, as she had woken up licking her lips. The sun was rising quite prettily, though. A few clouds had drifted across the sky in the night, and now the sun was hidden behind them, lighting the edges in brilliant silver and sending shafts of light in every direction. Mhumhi could hear the birds calling, and the faint sounds of another screamer fight in the distance. He rose to his feet and stretched slowly. Kutta, sitting up, leaned against him and licked his right ear in a drowsy way. Tareq turned over with a mumbling sound. Mhumhi noticed that Vimbo’s gray back was missing on the other side of Mini. Perhaps it would have been wiser for one of them to stay, despite Mini’s words, but the excitement of the place was still tugging at them. Even with the glum outlook last night’s conversation, Mhumhi couldn’t help but feel buoyed up by the sight of the birds, the salt water, and the endless possibilities for discovery that the place offered. He and Kutta set their noses to work, sniffing around in the garbage, ranging wide and then circling back. Kutta, some distance away, gave a little whistle. Mhumhi’s head popped up from the large pair of nail clippers he was poring over and loped to her side. She was digging through a mass of old newspapers, their pages congealed together around other items like cement. Mhumhi helped her, dragging away papers with his blunt claws. They finally reached their prize- an old cardboard box. Kutta grabbed it by the edge and pulled it out, and Mhumhi took the opposite corner so they could tug it apart with a ripping sound. Plastic packets fell out like rain. Mhumhi dropped the cardboard and sniffed around. Most of the packets were empty, but here and there there was a single small piece of something left inside them. It was sickeningly sweet, whatever it was, and curled his tongue, but he ate it anyhow, snapping each bit up like Kutta was doing. All too quickly they had consumed everything there was to have in the packets, though they sniffed hungrily again and again at every one. The inside of Mhumhi’s mouth felt crystallized with sugar. Mhumhi agreed, and trotted after her when she ranged off again- but then he hesitated. Kutta followed his gaze. There were two screamers on the ridge a few feet away from them, crouching and staring at them. “Sorry there’s none left,” she said. They went on, sniffing. The screamers crept forward as they left to pick at the empty plastic packets they had left behind. Mhumhi and Kutta found a few more scraps- an old can of something fatty and slimy that had been stuck on the underside of a plastic tarp, a few crumbs at the bottom of an overturned glass dish. The original two screamers returned, skulking after them by a few meters, and two more had appeared beside them. Mhumhi was beginning to feel a bit nervous. “Should we try to scare them?” he murmured to Kutta. She was panting, but her tongue and nose looked dry. Mhumhi felt more parched just looking at her. They moved on again, crossing a ridge so that they were in view of the vast plain of saltwater. The floating garbage rolled on the waves, and the birds were wheeling all around. Mhumhi was staring at the birds again, watching them hop around on the hilltop. Kutta nudged him and he blinked. “I wouldn’t be surprised if the hulkers figured out a way to fly, too,” said Mhumhi. “I’ll believe it when I see it,” retorted his sister, her tail bristling. Mhumhi gave a little whuff of laughter, and then, struck by a sudden burst of glee, dashed towards the birds on the hilltop. They flew up, making raucous sounds of protest. Mhumhi jumped up at them, whining and twittering. He heard Kutta laughing as she caught up to him, and then abruptly she turned her ears forward and down to the ground. Mhumhi joined her. She was digging at a patch of ground where there was a small mass of torn-up strips of paper and plastic and fluff. “I smell it!” said Mhumhi, eager, and shouldered her out of the way to start sniffing into the little depression. The birds above them seemed to get more shrill. Mhumhi’s nose encountered something smooth, and he picked it up in his teeth to show it to Kutta. It was a round speckled thing that smelled like there was something wonderful inside. “Open it up,” Kutta urged, and Mhumhi obligingly applied more pressure. It took very little- in fact, less than he expected- and the object shattered, thick fluid spilling down either side of his muzzle. At once Kutta started licking the spot where the fluid had fallen, heedless of what it was on. Mhumhi grimaced, trying to get the hard bits of shell out of his mouth. Kutta raised her head and started licking his mouth, too. “Leave some for me,” he said, leaning away. There was. Mhumhi took this one out more carefully, cracking it delicately so that the shell stayed in one piece before he set it down. He tried to shoulder Kutta out of the way while he lapped it up, but she just went around him, catching his chin with a few more swipes. “Any more?” he said, raising his head. Kutta sniffed about through the ruined nest. Kutta was amenable to this idea, and they set out again, splitting up to sniff. Now that he knew what he was looking for, Mhumhi stumbled upon another nest at once. He scraped away the covering and eagerly cracked open the first egg. Something fell out of it, into his mouth, and it moved. Mhumhi gave a strangled yelp and spat it out, leaping away. Mhumhi ignored her and sniffed warily closer. The thing that had fallen out of the egg was still moving on the ground, on top of half a soda bottle. It appeared to be a tiny, hideous… something. Kutta pricked her ears and crept closer to smell it. Mhumhi eyed the thing another moment, until something clicked. Its movements were like the pink baby rats that Maha had once showed him. “I think it’s dying,” said Kutta. The little thing’s movements were getting slower. “How did it get into that shell?” Mhumhi asked, his tail tucking. “It’s dying,” Kutta said again, and then she snapped the little creature up in her jaws. Kutta stiffened, but she also swallowed. “You could’ve waited for it to die,” he said. Kutta caught his gaze. Mhumhi looked away. He heard Kutta lick her chops. Kutta went forward, her head low, and nosed at the nest. Mhumhi looked out across the hills and was startled to realize how close the screamers were getting. There were some right at the bottom of the hill they were standing on, and more scattered all around and beyond. There were some screamers edging around to the side of the hill opposite them, moving slowly, looking up at them. The white birds, wheeling ceaselessly overhead, seemed to get agitated again, calling harshly. Two shot out of the crowd and flew low at the screamers, who put their hands over their heads and cringed. “I wonder why they don’t attack us,” said Mhumhi. “Because you said you’d eat them,” Kutta said, nudging him. The screamers on the other hill had retreated, huddling together for comfort. Mhumhi looked down at the ones directly below him. He thought their eyes got wider. One, near the front, put his hand out. “Beggar,” said Kutta. Mhumhi went back to the nest they had opened up and picked up the last egg in his teeth. “What are you doing?” said Kutta, looking startled, but Mhumhi put the egg down at the edge of the hill and rolled it down with his nose. The leadmost screamer shoved forward and grabbed it. The others clustered around him, crying out, but he’d already got it in his mouth, and clapped his hands over his lips for good measure. Slowly the crowd turned back to look at Kutta and Mhumhi again, staring at them at the top of the hill. She nudged Mhumhi and went back to the nest, apparently in good humor. Mhumhi stayed where he was. Kutta’s words had struck a painful chord in him; they made him think of O, weeping and begging for extinction. He gazed out over the screamers. The one that had gotten the egg was now spitting out bits of eggshell, wiping his chin with the back of his hand. Mhumhi wondered if that egg had contained a baby bird as well- the screamer certainly hadn’t minded if it had. A thought pricked at him, a dark and awful thought, and he shook his head, and then looked at the screamers again. These aren’t hulkers. Maybe it’s better that way. “Even with the glum outlook last night’s conversation” of last night’s?